Marni just loves to take baths and it has become a bit of a Sunday ritual for her. 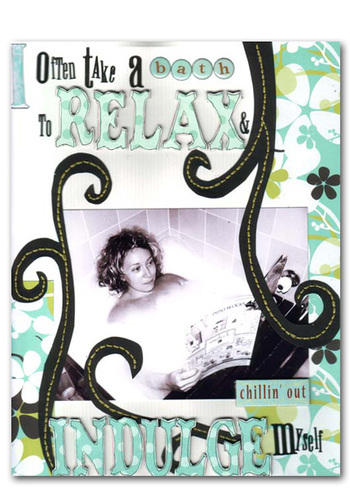 She can often be found relaxing on a Sunday afternoon while dinner is cooking in the bath with a scrapbooking magazine or book just chillin out and having some alone time. In this layout Marni used some Lil Davis papers and complemented them with some black handcut swirls. She used one of the onserts in the current For Keeps as well as a mixture of letter stickers and chipboard letters to convey what a bath means to her. Ahhh, relaxation for Mel equals tidy bedrooms. Nothing makes her more frustrated than dust combined with toys in the bedrooms. Luckily both of her children are super at keeping their rooms tidy. Sure they both play and then trash the rooms in the process but they are both quite happy to clean up when needed. Mel scrapped photos of her daughter's room so she went with the BasicGrey Urban Couture patterned papers to tie in with the colour scheme of the room. The Lil Davis large vintage wood letters helped to highlight the first word in the title. Hanging out with friends - is there a better to way to chill out? Nic has based her layout this time on the friendship of her daughter and best friend. She has used the Li'l Davis Chipboard from this months For Keeps magazine, and attached it over the top of a Heidi Swapp Chipboard Flower. Nic has also used Heidi Swapp Chipboard to create the title. 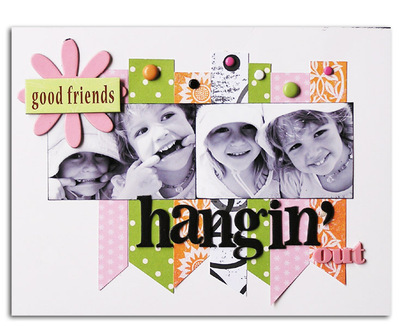 The photos have been turned black and white then black ink has been used around the egdes to help the photos stand out on the mixed patterned paper background. Nic has used a mixure of BasicGrey, SEI and Scenic Route papers. A simple style layout where the focus is on the journaling. 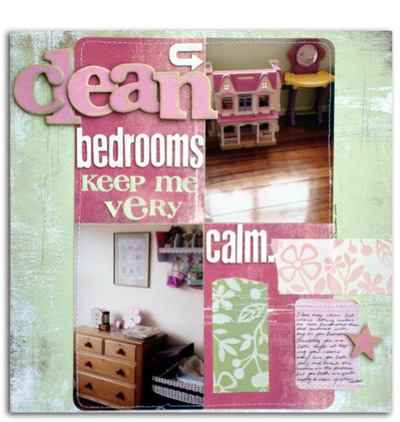 This layout by Tamar talks about the way creating from a raw product into something of beauty is relaxing for her. She has left the BasicGrey chipboard "raw" to demonstrate this. Sometimes it’s relaxing for Caz to just hang around the house with the other members of her family - that would be when there are no arguments or near riots, and everyone is either getting on together or co-habiting happily in their own separate spaces. 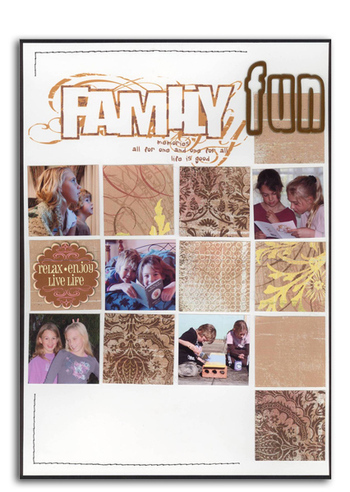 This months theme features smaller photos mosaiced with pieces of patterned paper. Caz has used not only the lil davis chipboard onsert but also lil davis ‘rockstar rub-ons’ and their groovy ‘outlined chipboard alphabet’. 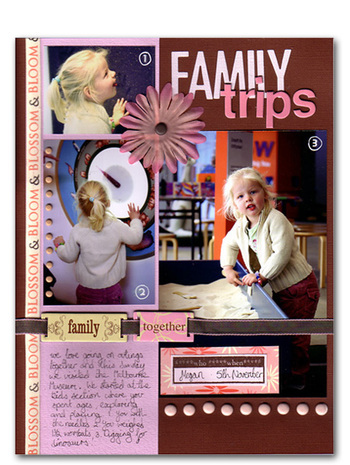 This month Rach decided to work on the theme 'Family Trips' something that they do often and is one of her favourite ways to relax. On this particular Sunday they visited the Melbourne Museum and Rach snapped all these photos in the kids area which Megan adored. 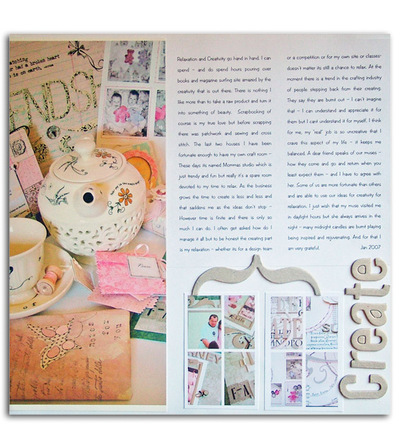 On the layout Rach has featured a mix of products including Li'l Davis Chipboard Ribbon Sliders across the centre of the page and Heidi Swapp Chipboard letters overlaying her Quickutz Title.